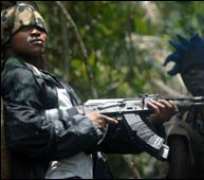 The Federal Government's amnesty programme for militants in the Niger Delta has got a big catch: Ateke Tom, the leader of the Niger Delta Vigilante Movement (NDVM). Ateke, who had earlier called for the withdrawal of the Joint Task Force (JTF) from the restive region as a condition for surrendering his weapons, last night dropped the term and embraced the deal. That leaves Government Ekpemukpolo, aka Tompolo, as the only major militant leader yet to accept the government's olive branch. Tompolo had asked for an extension of the deadline by three months. THISDAY learnt last night in Abuja that pressure now mounts on Tompolo to accept the amnesty offer. “Key officials in the Federal Government's amnesty programme like Defence Minister and Chairman of the Presidential Amnesty Committee, Major-General Godwin Abbey (rtd), and Honourary Adviser to President Umaru Musa Ya'Adua on the Niger Delta, Mr. Timi Alaibe, have stepped up efforts to prevail on Tompolo to embrace the offer,” a source said. It was learnt that Tompolo may eventually embrace the peace deal before the end of the amnesty period. The Federal Government had three days ago read the riot act to unrepentant militants, saying it would deal ruthlessly with those who fail to take advantage of the amnesty offer at the end of the deadline. Government again ruled out the possibility of extending the 60-day amnesty period, which ends on October 4, 2009. Yesterday, President Yar'Adua received Ateke at the Presidential Villa, Abuja, describing the militant leader's embrace of the amnesty offer as his 49th independence anniversary gift. Ateke was earlier flown to Abuja in a Presidential jet to meet the President. THISDAY learnt that Ateke, who was being cultivated by Alaibe, was airlifted with a helicopter from a place between Camps four and five run by him in Rivers State. He was flown to Owerri Airport where a waiting Presidential jet took him to Abuja Airport from where the entourage went to Nicon Hilton Hotel, Abuja, to have lunch before proceeding to the Presidential Villa to have audience with the President. “Today, Chief Tom Ateke you have given me my 49th independence anniversary gift and I cherish it so much,” the President said while receiving Ateke and six of his field commanders at the First Lady's Conference Room, Aso Villa. Yar'Adua urged the remaining militants who have not embraced the offer to take advantage of the remaining two days to toe the path of Ateke, reiterating that after October 4, he would sit together with the ex-militants and jointly fashion out rehabilitation and reintegration programmes that would be beneficial to all the people. Present at the occasion were Vice-President Goodluck Jonathan, Abbe, Secretary to the Government of the Federation, Yayale Ahmed, Chief of Defence Staff, Air Chief Marshall Paul Dike and the National Security Adviser, Sarki Mukta. Others were Alaibe, Director-General, National Orientation Agency, Idi Faruk, National Coordinator of NAPEP, Magnus Kpakor, and Ateke's Lawyer, Uche Onyeaguocha. Ateke's field commanders who accompanied him to the villa were Friday Idaiko, Oppiah Ojey, Felix Wida, Rowland Okubor, Amos Gilbert and Richard Akinike. The President, who proceeded to his Katsina home state immediately after the event, acceded to Ateke's request to meet with him privately on his arrival to Abuja next week. In a short remark at the occasion, President Yar'Adua said: “First, I would like to praise and thank God Almighty for this afternoon visit. Today, Chief Tom Ateke has just given me my 49th independence anniversary gift. This independence anniversary gift you have given me I cherish very much because of all those things I cherish one of them is peace and security in the Niger Delta. “It has always pained me to see our brothers and sisters in Nigeria taking up arms against fellow Nigerians and ready to live in the creeks under very difficult situations and conditions because of such issues that agitated their mind. But by the grace of God and the kind heart and goodwill you have brought to this amnesty programme, this is coming to an end. “I want to commend you and members of your delegation and to thank you very much. You may not know what you are doing for your people and the nation now, it will become evident in the future. “Continue with the peace and security in the Niger Delta region. In a few years, five year or so, you will see the kind of development that will take place, then you will thank God that you decided to take advantage of this amnesty so that together we will join hands to work diligently for the welfare and wellbeing of our people. “This administration understands the challenges of the Niger Delta region and the challenges people are facing and that is why from the beginning I made Niger Delta a top priority in our seven-point agenda. I want to say that the amnesty is not an end in itself but a means to an end. It is a means to peacefully and lovingly with brotherly understanding bring to an end all insurrection and misunderstanding between brothers. It is a means to bringing stable peace and security to the Niger Delta region. It is a means of making the two of us work together to ensure that our youths do not take up arms again. “We will work together to ensure that youths in the Niger Delta have a meaningful life through the kind of programmes we will evolve, train them and help them to establish businesses. Those who want to further their education to whatever level to help them to do that to ensure that each and everyone of them has a career and a life to be proud of and that he would stand to be proud of himself, his family and his country and he would be proud that he is a Nigerian. “The other thing is to look at the problems that caused the agitations in the Niger Delta in the first place. These are problems that are well known for a very long time. We will not just say you drop your arms and go. Ateke, who spoke in Pidgin English had earlier thanked the President for the amnesty offer and the decision to meet with him at the State House. He recalled that he was the first person to accept the amnesty offer and assured President Yar'Adua that after yesterday's event, he would proceed to his Camp 4 to surrender all his arms in fulfillment of his acceptance of the offer. He said: “I meet with Defence minister them come our camp, ask us say wetin be our problem, we tell them our problems. The problems this Niger Delta get no be new story, na story wey the whole world know. “Your amnesty, immediately you announce the amnesty, I be the first person way embrace the amnesty because I like the amnesty. But things wey we talk we dey worry us make una try do am for us because we dey suffer for Niger Delta and we believe you. Me particularly I believe you well well. I know say the things dem wey you promise you go fit do am for us but the people wey no fit endure am na him no fit endure am. Ateke had waited till the last minute to embrace the amnesty, having pressed for the withdrawal of JTF from the creeks and payment for his arms by the government, which had insisted that since the amnesty was unconditional, acceptance by militants should also be unconditional. Ateke's lawyer said that it was likely a calendar of submission of his arms would be announced by Ateke at the conclusion of the parley. Meanwhile, the division within the ranks of militants in the Niger Delta widened a little more yesterday when the apex decision-making body, the “Joint Revolutionary Council” (JRC) distanced itself from the team selected by the Movement for the Emancipation of the Niger Delta (MEND) to negotiate between it and the Federal Government. MEND had named Vice-Admiral Mike Okhai Akhigbe (rtd) and Prof. Wole Soyinka as members of the team. According to a statement by spokesperson of the council, Cynthia Whyte, the amnesty by the government has been ongoing in all parts of the Niger Delta and there is no need for the nomination of anybody as negotiator or observer. Whyte alleged that those posing as having a hang on the peace in the Niger Delta were only seeking to have a few medals to their resume. He vowed that they shall be brought to book. Whyte said:“On behalf of the Joint Revolutionary Council comprising alliance units of the Movement for the Emancipation of the People of the Niger Delta, The Reformed Niger Delta People's Volunteer Force and The Martyrs Brigade, I hereby declare a complete dissociation of the JRC from the claims by an email address that a group of persons have been shortlisted to oversee or observe the disarmament and amnesty process currently ongoing across the length and breadth of the Niger Delta. “We reiterate that we have no business with this group and declare that all those who seek to trade the efforts of our heroic combatants in the creeks for a few more medals to their resumes and curriculum vitas shall be called to judgment. “For a few years now, the just struggle for the liberation and emancipation of the people of the Niger Delta has been converted to an avenue for a hungry and relevance seeking band to create quick employment and absurd leverage for themselves. From filthy and corrupt politicians to phony NGOs and self-centered individuals.